What company is there that prints 3D objects in outer space? The company is Made in Space. Formed by entrepreneurs Aaron Kemmer (CEO), Jason Dunn (CTO) and Mike Chen (CSO) in 2010 to tackle Singularity University’s challenge of creating a project that would affect 1 billion people, Made in Space has grown to be an innovative new space company focused on additive manufacturing — more commonly known as 3D printing — in space attracting quite a following (and funding). In the last quarter of 2014, the world’s first zero-gravity 3D printer built by Made in Space was launched to, installed on, and operated with no hitch on the International Space Station. 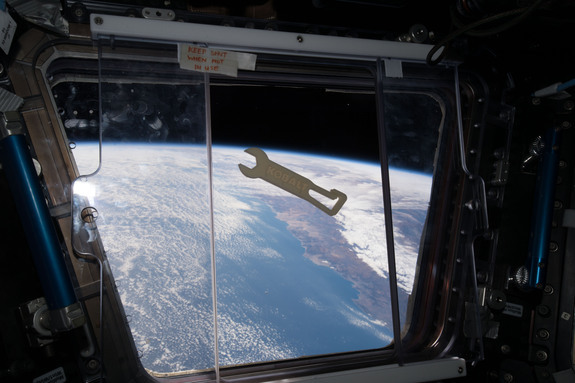 In June this year , the first tool ever manufactured in space, a wrench branded with toolmaker name Kobalt, was 3D printed on the ISS at its Additive Manufacturing Facility (AMF) thanks to Made in Space, which built the AMF, and home improvement giant Lowe’s. The entrepreneurs, innovators, and researchers at MIS have developed several devices including tactical 3D printing (TAC3D), extended structure additive manufacturing machine (ESAMM), and vacuum additive manufacturing (VAM). The full extent of what each piece of tech entails is interesting but delves deep into the technicalities so let’s take a look instead at the exciting space projects on the horizon for them. Although it sounds like a spider that wants to be a spacecraft, Archinaut is a project selected in November 2015 by NASA’s Space Technology Mission Directorate (STMD) to enable additive manufacturing (3D printing) without astronauts. Made in Space is working with Northrop Grumman and Oceaneering Space Systems as NASA subcontractors in developing Archinaut. Eventually, this project will lead to a wide range of in-space manufacturing and assembly capabilities by combining robotic manipulation with additive manufacturing. 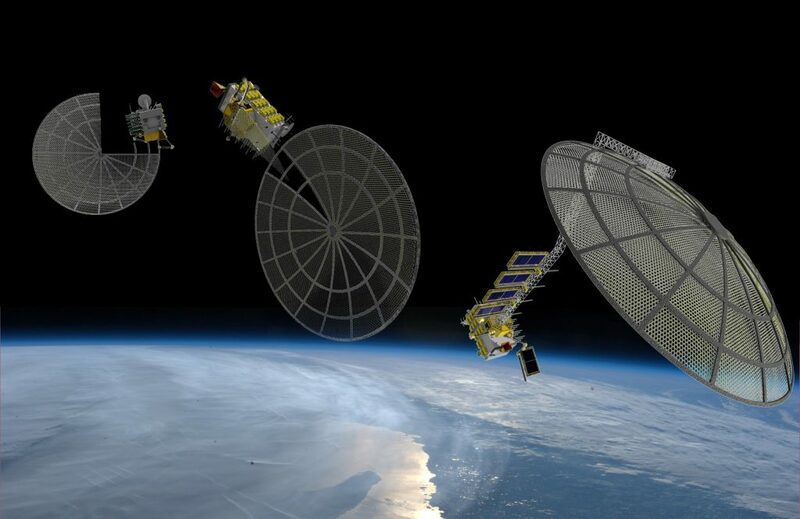 As a first step, Archinaut is developing the Optimast™ boom manufacturing system — a system that can be integrated into commercial satellites to produce large, space-optimized booms at a fraction of the cost of current deployables. Why is this significant? Archinaut will enable fundamentally new spacecraft designs and reduces costs. Traditionally, satellite design is constrained by the payload shroud and launch load / environment survivability requirements. Similarly, due to lift capacity limits and the high risk and limited availability of astronauts, creating large space-based structures such as space stations has been costly and slow. Archinaut is optimized for the space environment rather than the launch environment! Made in Space recently won a NASA Innovative Advanced Concepts (NIAC) Phase I award worth $100K over a 9 month period from NASA to investigate how to turn asteroids into giant, autonomous spacecraft. Reconstituting Asteroids into Mechanical Automata (RAMA) involves sending a robotic “seed craft” to rendezvous with a near earth asteroid (NEA). This seed craft harvests materials from the asteroid construct navigation, propulsion, and other systems to be then programmed to fly to a mining station. Rather than using electric components, the entire spacecraft will be mechanical and simple. 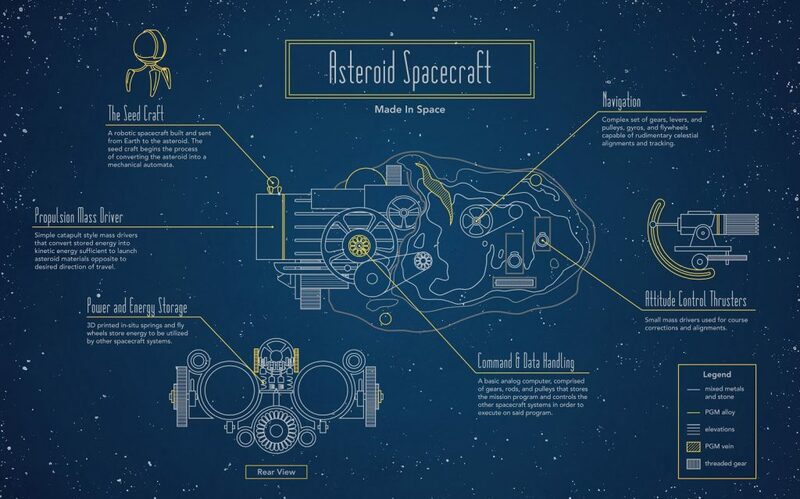 For instance, the computer would be analog while the propulsion system may be simply tossing rocks out of one side, thereby pushing the asteroid in the opposite direction. Details need to be worked out but that’s what the NIAC funding is for. In some aspects, this is not as far-fetched as it may at first appear. Autonomous 3D printers that use mechanically driven systems already exist and so do mechanical computers made of 3D-printed parts. “The anticipation that the RAMA architecture is a long time line, and when it becomes capable is about the same time that people really need resources,” Dunn said. Made in Space is not just focused on space. Dunn continued and stated that RAMA can also have terrestrial applications, notably building structures autonomously in remote regions as well as in ordinary construction. The future of Made in Space looks promising with all its projects ranging from the currently feasible to future tech and no doubt its impact on the world may be even more so than just 1 billion people.